7zip Colorix is a alternative icon theme for 7-Zip compression utility. 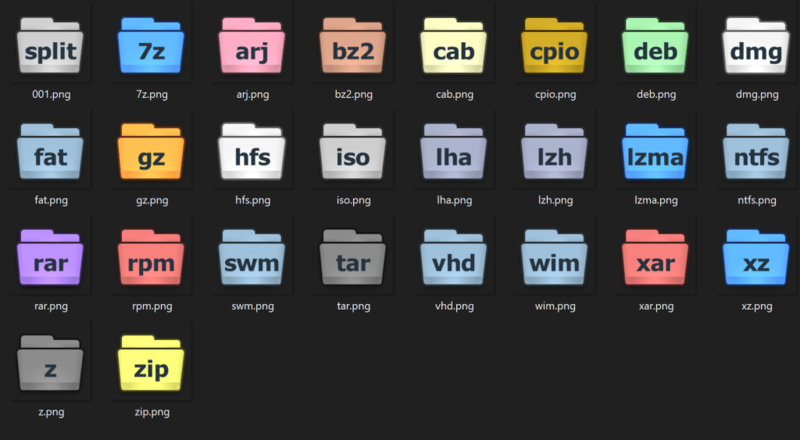 I didn’t like the old style Win9x icons that 7-Zip used (and uses) so I made the Colorix icons based on original artwork from Greven, Titanium Folder Set I with his permission and blessing :). They were made to be simple and allow quick archive type recognition trough the use of different color (hence the colorix name). A big thanks to Greven and my friends Newtomic, Sylver and Zero for this and that, during the making of these icons (one should never forget his friends). To install just follow the howtogeek guide to download 7ztm, then just replace the bundled Colorix theme with the updated 4k one. Pingback: milko´s spotLight » Beitrag » Wie ändert man 7zip Icons?